Quick Scoop: You all know that I don't really like coconut, so we'll keep this short and sweet. 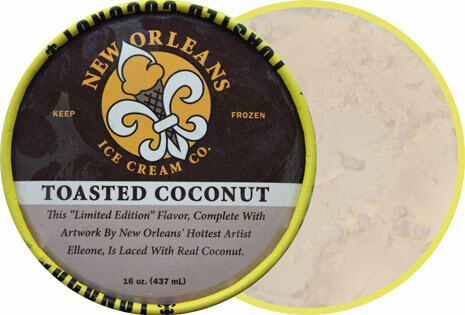 This is a free sample of New Orleans Ice Cream Company's Toasted Coconut Ice Cream. Notice the unique pint design. 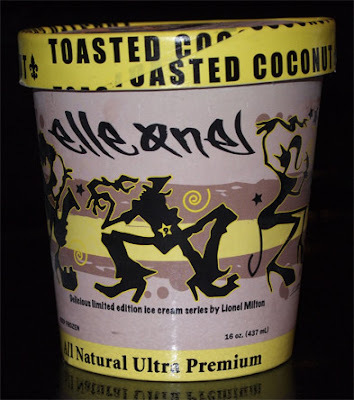 The description reads "This 'Limited Edition' Flavor, Complete with Artwork by New Orleans Artist Elleone, is Laced with Real Coconut". When I first opened this pint, it had a buttery smell to it which has mostly faded and been replaced by the smell of shaved coconut. I dig in slowly (twice now) and it's not bad actually. It's got big meaty shavings of coconut which some will adore, and the base is nice and sweet. It's a fine flavor.... and I'm actually fairly tempted to keep eating it. There's almost a candy filling vibe that is trying very hard to keep my attention. I don't need to love coconut to know they did a fine job on this one.